Posting Pilot Scarlett the other day has reminded and encouraged me to get back into the all-but-forgotten tail end of the 2008/2009 Preserve archives. There are still literally crates of great new toys sitting around here that have yet to make their presence known in pictures! 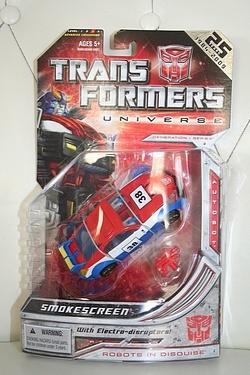 Let's finish up wave 5 of the Deluxe figures from the Transformers Universe collection with Smokescreen - an old favorite from the G1 line, he is sporting his original paint job and immediately triggers fond nostalgia for any long time fan. Click the image for his full bio, stats and more pics!